But enough of my sappy, emotional sermon. Why don’t I just explain the reasons why this restaurant is so special? Sure, I could describe the dimly-lit, neighborhood atmosphere, or the professional-yet-incredibly-friendly service. I could certainly discuss the expertly chosen wine list, created by co-owner Shelley Lindgren, whose wine program at sister restaurant, A16, has been nominated more than once by the Beard Foundation. Of course all of these factors add to the overall experience. But, at the end of the day, what keeps me coming back for more is the food. Because the menu is ever-changing (every week, in fact), it’s difficult to describe stand-by dishes, or even seasonal favorites. Therefore, I’ll simply describe my most recent meal at SPQR which, like every dinner here, was both exceptional and memorable. It started with a slightly spicy, juicy bowl of fried Padron Peppers ($9), seasoned with celery salt and served with a saffron sauce – an aioli that makes you forget that it’s roughly equivalent to mayonnaise and will have you shoveling spoonfuls of sauce into your mouth before realizing what’s happened. The Antipasti followed, staring with a house-made Terrina of Berkshire Pork ($15), laid atop a mash of crimson pluot and accompanied by pancetta-fat bread budino and wild arugula. One bite brought me back to 5ème arrondissement of Paris, alongside the quai of the Seine, enjoying a rustic picnic with good wine and close friends. Wonderfully balanced by the grassiness of the arugula and the hint of salt, this dish was an unexpected highlight. The “Brassica” ($15) featuring fried broccoli and cauliflower, bagna cauda emulsion, white anchovy, and mustard greens followed – a delicious, tempura-like presentation of some of my favorite vegetables. 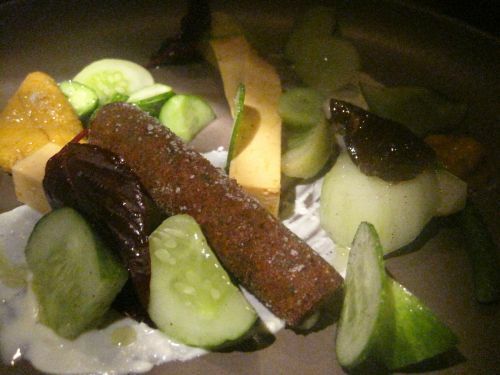 This was followed by an item that I was initially hesitant about ordering: the “Ricci” made of Sea Urchin Panna Cotta ($16), cucumber, fried chickpea, amaranth, and mascarpone. Trust me, even if you’ve had bad experiences with sea urchin in the past, this dish will make you forget about them and have you asking for seconds. The strong Mediterranean/Greek flavors, brilliantly combined with the briny, locally-sourced sea urchin, will make you remember that at the height of the Roman Empire there was more to “Italian food” than just the cliché cuisine we think of today. 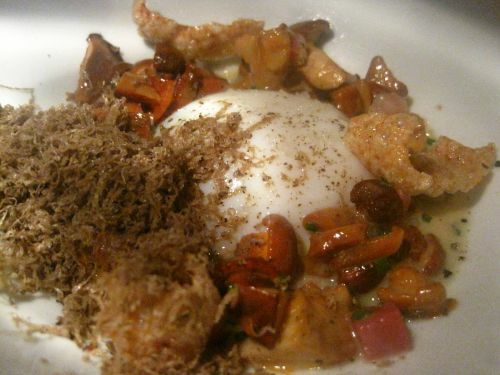 Finally, the Uova ($17, pictured above), a dish comprised of a Soul Food Farm egg, golden chanterelle mushrooms, house-cured bacon, garlic chive, and burgundy truffle, ended our appetizers on a high note. There’s no denying that such a mouth-watering combination of ingredients is slightly cheating, but nonetheless, it was rich, creamy, earthy, and a definite show-stopper – good enough to tempt you into licking the plate. 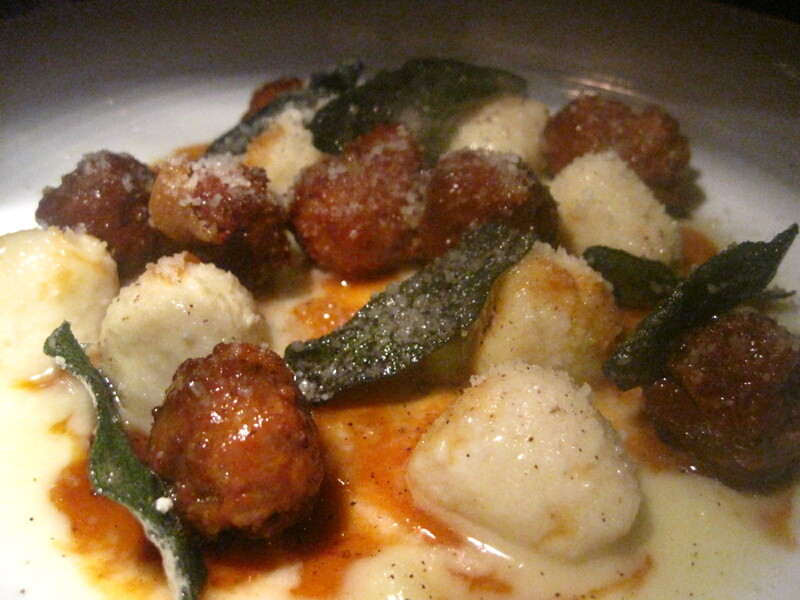 Our entrées began with the House-Made Pork Meatballs, served with ricotta cheese and fried sage. As I said at the time, “Eets-ah-just like ah-how mama would make-ah dee meat-ah-balls when I was only a bambino... Weeth–ah-dah pork dat ah-ees braised for eight hours, and dah ricotta, weeth-ah-dah fried sage-eh. Ahhh bellisimo!” But seriously, those were some crazy good meatballs. Good enough to make me forget about the Raviolo ($19) with trufflebert hazelnut and summer truffle I had ordered, before Chef Accarrino decided to hijack my order and send me what was clearly in my best interest. 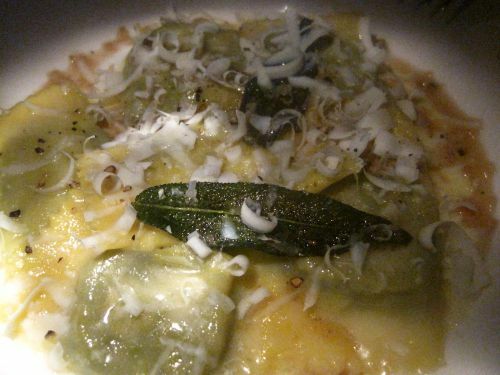 Without a doubt, the menu item that best differentiates SPQR from most other Italian restaurants is the pasta. 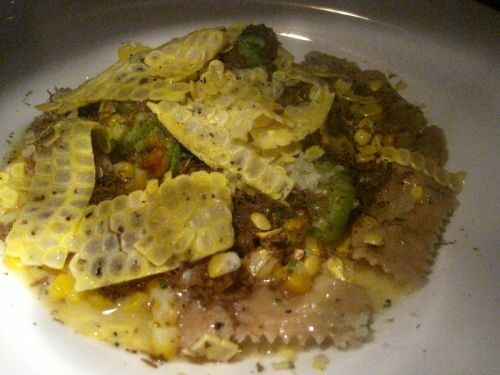 The Summer Corn Agnolotti ($19) that I worshipped in 2010 (ordered off of the tasting menu) was spruced up from last year, with the addition of a few squash blossoms, a slight, corn-enhancing tweak to the sauce, and a couple of small adjustments in presentation . 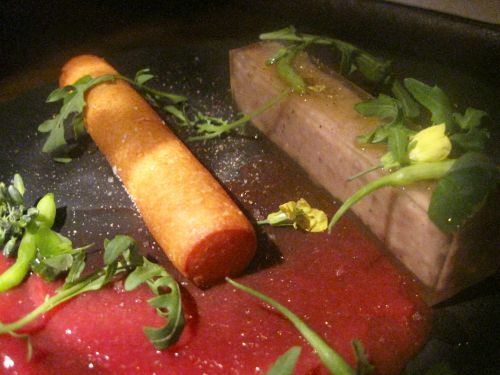 This dish was just as good as I had remembered, and remains an all-time favorite. Finally, a newly added pasta was almost equally delectable. Although it reads rather bland on the menu, the Tortelli ($18), filled with kale and goat cheese, pine nut, ricotta salata, and sage was surprisingly tasty. Certainly not for the faint-of-salt, but delicious nonetheless. Unfortunately, such a filling meal left no room for dessert, which is generally not something that should be skipped. Although I can’t describe a recent dessert selection, I can say that few restaurants serve dessert worthy of being noticed; even fewer can fill you up with carbohydrates and still have you reading over the dessert menu, and SPQR is one of those few. After two years of impressing the hell out of this diner, there’s no denying that the entire kitchen crew is incredibly talented, and that Chef Accarrino’s vision and execution is legendary. I don’t hesitate to rank SPQR as one of my most highly regarded restaurants in the U.S., and certainly an all-time, San Francisco favorite. No matter who I’m with, no matter what the occasion, or what expectations I may have, SPQR delivers…every. single. time. Will have to look into this place further when I'm back in December. There's actually corn inside the pasta, as well as the rough cut over the top. I believe the inside filling has been pureed, and the liquid used to do so is actually juiced corn. Everything is corn! It's a delicious dish. You could call Matt's pastas more rustic than what you'd see at a 3 michelin star place, but actually the technique and thought that goes into them are just as advanced as any upscale Italian place I've been to. Don't forget, he came from Per Se and opened Craft LA, he's got a fine dining background, so the food you get at SPQR is far more elevated than your usual, neighborhood eatery. I haven't been there yet! I've been really meaning to go. Now I know what you have been talking about all these years. Apparently, I like sea urchin. And, John and I definitely did not skip dessert!